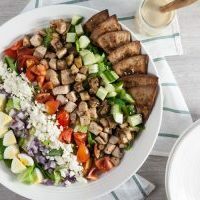 Classic Cobb salad gets a Middle Eastern twist with eggplant, feta, and cucumber. Top it off with a delicious homemade hummus vinaigrette and toasty za’atar pita wedges for an easy but satisfying dinner that can be prepped ahead. It’s still warm outside, but I can tell that fall is on its way – the days are getting already shorter and all of a sudden I’m craving apples and chai and feeling the urge to bake. Since I know I’ll be loading up on fall treats soon enough, I’ve been making an effort to balance things out by squeezing in as many last-minute summer salads as I can. 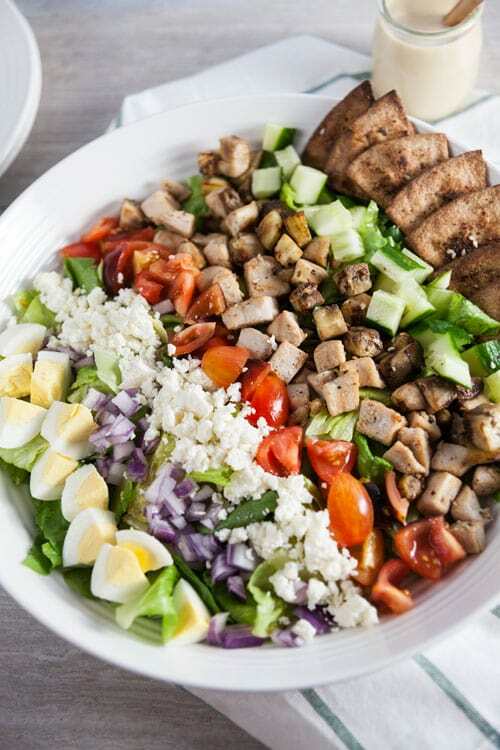 Classic Cobb salad is always tasty, but with bacon, avocado, and blue cheese, it can leave you feeling weighed down. I made this Middle Eastern inspired Cobb salad for dinner last week, and it felt much lighter – plus the flavors were delicious. All of the ingredients in this salad are delicious, but the hummus vinaigrette and za’atar pita chips are what makes it extra-special. The hummus dressing is inspired by a similar vinaigrette that I had after I went rafting in Richmond with Sabra. I started with Sabra’s classic hummus, which is super smooth and has a nice punch of garlic, then thinned it out with lemon juice (you can also use lime juice, like I did for my second batch) and olive oil. I like my dressings on the acidic side, so I also added a generous splash of red wine vinegar to add a little extra brightness. 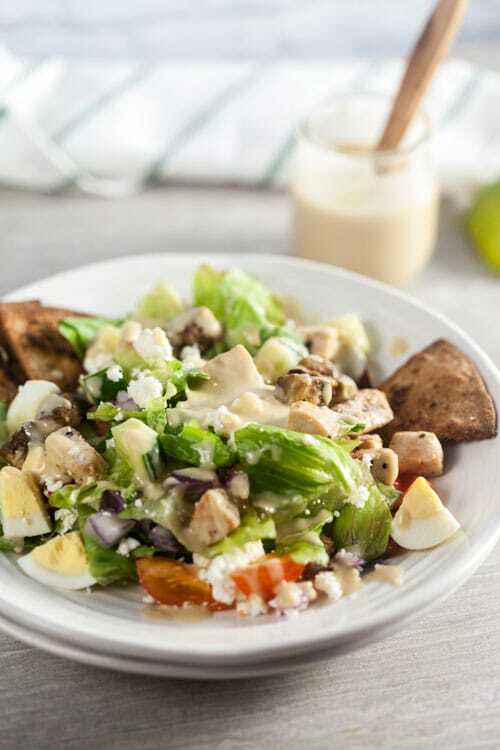 The result is a thick, creamy dressing with tons of flavor. Since every salad needs a little bit of crunch, I also made some za’atar pita wedges. Simply cut up pita or flatbread, brush with olive oil, and sprinkle with za’atar (a Middle Eastern spice blend made with sesame, thyme, and sumac). Then bake until they get nice and crispy. If you have any extras, they’re perfect for snacking on with leftover hummus. You’ll basically have a mini salad bar at your disposal, and you can mix and match ingredients to suit your mood. In fact, I’ve had it for lunch every day this week! Heat the olive oil in a large skillet set over medium-high heat. Add the chicken and season with salt, pepper, and granulated garlic (if using). Cook, stirring occasionally, for 4-6 minutes, or until cooked through and lightly browned. Transfer the chicken to a plate. Add the eggplant to the pan and sauté 4-5 minutes, or until cooked through. Transfer to a plate. Place the romaine in a large serving bowl. Arrange the chicken, eggplant, vegetables, egg, and pita wedges over the top. Serve with hummus vinaigrette. 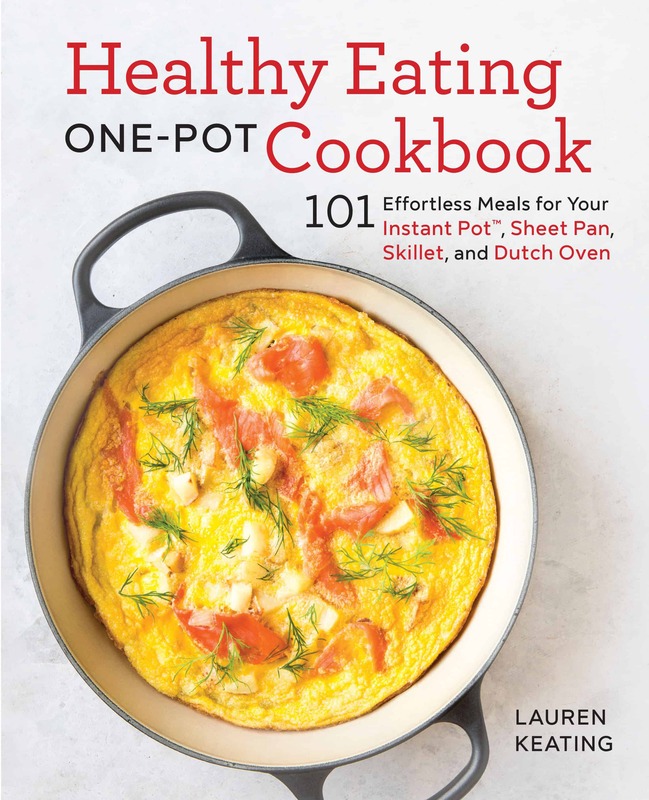 In a small bowl, whisk together the hummus, oil, and citrus juice. Season to taste with salt and vinegar. Cut the each pita into 8 wedges and arrange on a baking sheet in a single layer. Brush lightly with oil and sprinkle with za'atar. Bake 6-8 minutes, or until toasted. I created this recipe for my client, Sabra. As a Sabra Tastemaker, I’ll be sharing recipes featuring hummus throughout the year. As always, thank you for supporting the brands that keep me inspired in the kitchen! Hungry for more hummus recipes? Try my Spicy Chipotle Hummus Pasta, Mayo-Free Potato Salad or Lemon Twist Blondies! Hummus is so perfect for turning into a dressing, I do it all the time too! Wish we had gotten to go rafting together, how fun was that?! 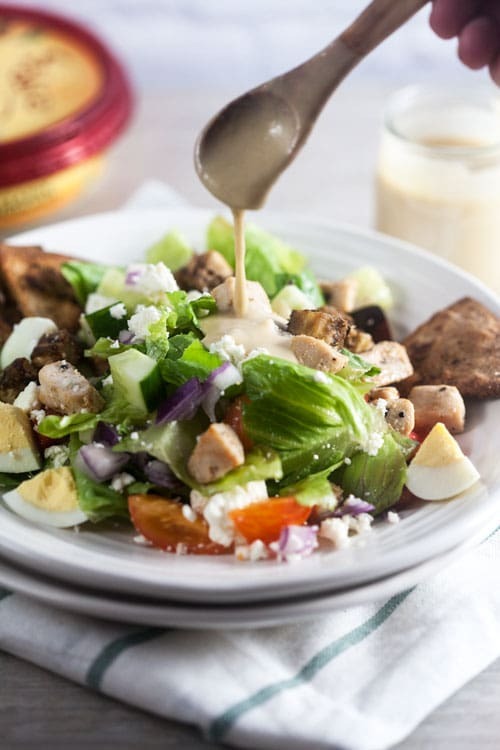 Such a delicious variation on the classic cobb salad! 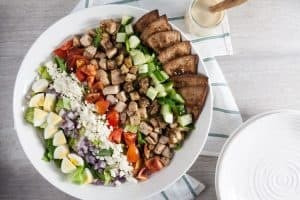 Love the Middle Eastern twist that you threw into this salad!I’m mostly eating salads for lunch now so this is going to be perfect for the weekly lunch rotation! We’re on the whole soup or salad for lunch thing, too. It’s definitely nice to have options to help mix things up! Hummus Dressing?!? OH MY GOD! WAAAANT! That is such a delicious idea, and that salad looks damn good! Gorgeous salad! 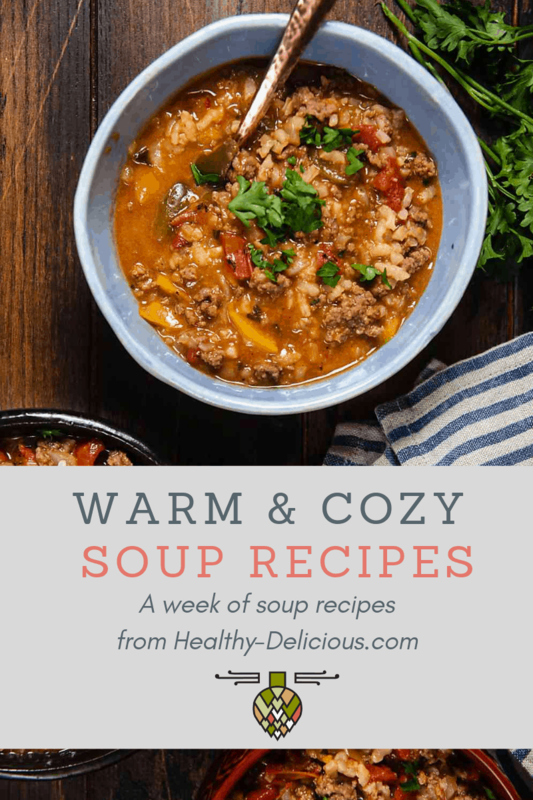 I love everything about this recipe and if I can get over my fear of cooking with eggplant, I’m totally making it next week! My type A personality loves a good cobb and hates messing it up to eat it. Beautiful presentation! I love the twist on the classic cobb. And who doesn’t love hummus! Yes yes yes! This salad is almost identical to the house salad at my favorite local Mediterranean place. Except I always make them add beets to mine. I’m trying to get them to re-name it “the Lori special,” but they haven’t yet. Anyway, they serve it with a creamy feta dressing, which is great, but now I REALLY want to try this hummus vinaigrette! So creative, and I bet it would be delicious drizzled over roasted chicken, too. This salad is so gorgeous! I love this middle eastern flair and those pita chips sound great in the salad or for snacking. So much yum! 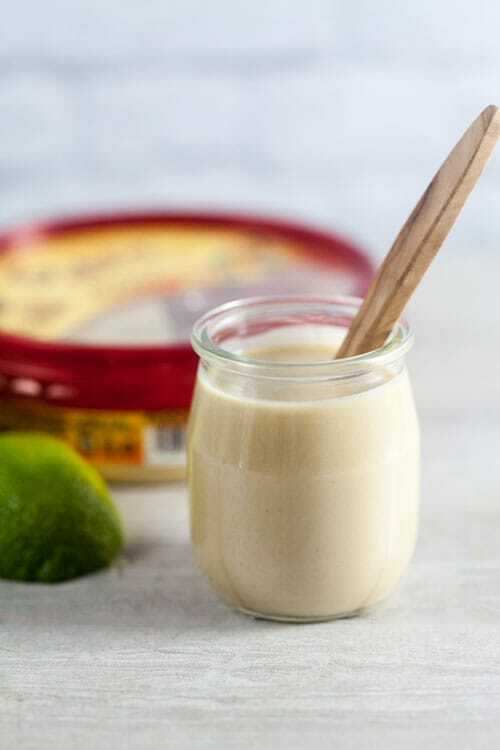 Wow, a hummus dressing. That’s genius!! This is one beautiful salad! I love that you turned hummus into dressing, GENIUS! That dressing sounds amazing — I hadn’t thought of transforming hummus into dressing! YUM. And this salad looks perfect. I cut up lots of veggies on Monday nights and snack on them (or just grab the baggies) for lunch later in the week. It’s such a great way to eat well when you’re busy.